8 MILE CLUB: Former East Coast Radio DJ and co-founder of the charitable Kydrin Foundation, Brad Ray, (right) and his sister Abigail Ray swam the aQuellé Midmar Mile distance eight times to raise funds for Singakwenza Education and Health, which provides Early Childhood Education programmes in disadvantaged communities. 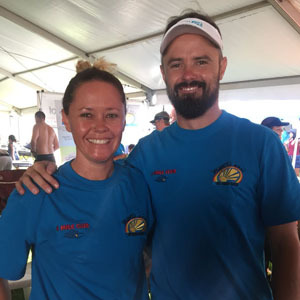 (HOWICK) – DESPITE a lagging economy, swimmers at South Africa’s premier open water championship, the aQuellé Midmar Mile, have smashed an ambitious target of raising R3-million for charities nationwide, fundraisers announced on Monday [12 February]. Drawing amateur and serious athletes of all ages, this past weekend’s event saw many swimmers raise funds for causes ranging from cancer to water awareness as Day Zero draws closer in the Western Cape. As of Monday morning, charity organisers announced that more than R3.1m had been raised – a staggering 55% increase on the R2m raised in 2017. And more is expected to flow in in the coming weeks, they say. “Not all EFT’s made over the weekend have come in yet. We’ll also keep fundraising open for a few more weeks to give people a chance to hit their targets. But it’s an impressive number regardless,” said Stan Kozlowski, chairman of the main fundraising initiative, the 8 Mile Club. “I’d imagine by the end of this week the 8 Mile Club alone will have surpassed the R3-million mark. We’re currently sitting on R2.98m raised, with the 16 Mile Club having raised R113,000”. Over 13,000 swimmers from across the country descended on Midmar Dam near Pietermaritzburg for the 45th edition of South Africa’s premier open water race. Among them were the 200-plus members of the 8 Mile and 16 Mile clubs. Suzelle Stegen, marketing manager for aQuellé, said the water brand was proud to support such great initiatives. “Helping the community is a key element of our brand. 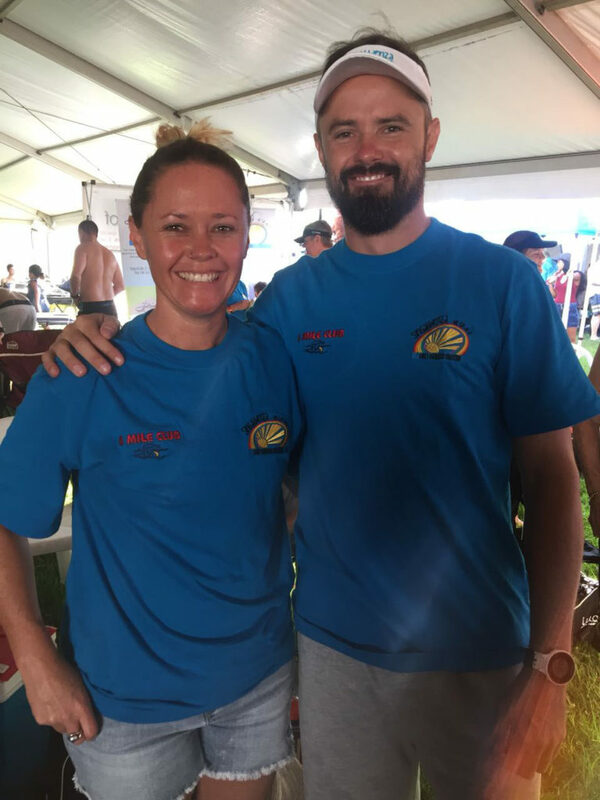 We love the fact that families, clubs and corporate teams can come together and take part in a healthy, water-based activity that spreads the joy and does so much good for many worthy causes,” said Stegen. The 8-Milers – so called for the distance each member swims for charity – each swam the eight-mile-long events on Saturday and Sunday to collect as much money as possible for their seven chosen charities. These included breast cancer charity Pink Drive, Singakwenza Education and Health, Childhood Cancer Foundation (CHOC), Princess Charlene of Monaco Foundation, KZN Wildlife for Save the Rhino, Wildlands Conservation Trust and the Cancer Association of South Africa. Former East Coast Radio DJ Brad Ray, 40, now living in Johannesburg, completed his fifth 8-Mile challenge. He and his sister, Abigail Ray, swam on behalf of Singakwenza, a non-profit organisation that works to improve the lives of disadvantaged children through early childhood education programmes. Joining the 8-Milers was former Paralympic silver medallist Terence Parkin, who is on a 902km cycle-swim-run journey to raise funds for the Deaf Children’s Learn to Swim and Water Safety Programme. Their 16 Mile Club counterparts raised funds for the Duzi Umngeni Conservation Trust (DUCT), which is dedicated to protecting the uMsunduzi and uMngeni rivers. Gary Albertyn, 49, of Pretoria, swam his first 16-Miler for DUCT two years ago. This past weekend he swam with Cape Town’s looming “Day Zero” in mind. “I think that with the reality of Day Zero looming in Cape Town and the water restrictions that exist in many parts of our country, clean water sources are more important than ever. DUCT provides a life-changing service and being part of the fundraising team for them is an honour,” said Albertyn. It was family affair, he said. Race director Wayne Riddin said the spin-off of the event as a major national fundraiser showed the true heart of South Africans. “We are incredibly happy that it has become a platform for swimmers to challenge themselves both physically and mentally, and to challenge their friends and families to contribute to their fundraising efforts,” said Riddin.